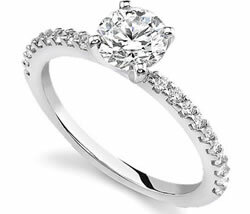 Engagement ring cost is often the deciding factor in choosing the ring. What determines the engagement ring cost? As you’ll soon see, a variety of factors are involved. Why does an engagement ring cost so much? The short answer is that most engagement rings have diamonds which are somewhat rare. Some people choose alternative stones such as rubies, but by and large, a diamond engagement ring is the norm. Diamonds can be expensive, but not always. Engagement ring cost varies depending on the quality of the diamond. Larger carat diamonds having no flaws or color are more expensive than flawed diamonds. Because of this, diamond engagement ring cost can range from $100 to $10,000 or more. The good news is that Novori can work with you and find the perfect engagement ring within your budget. Carat – the carat of a diamond plays a big part in the cost. The carat is a measure of weight and indicates how heavy a diamond is. A heavier diamond is a larger diamond and hence is more expensive than a lighter one. One way to lower your engagement ring cost is to seek out smaller carat diamonds. If you view the selection on our site, you’ll see the carat size listed with the diamond. This gives you a general idea about how carat size affects engagement ring cost. Color – colorless diamonds are rare; therefore, they are more expensive than colored diamonds. Diamonds lessen in price as the tint or color becomes more obvious. The engagement ring cost for a ring containing a colorless diamond will be expensive. The engagement ring cost gets cheaper as the quality of the diamond gets lower. Clarity – a clear diamond is more expensive than a cloudy one. A clear diamond can add a few hundred dollars to the engagement ring cost. It goes back to a flawless diamond being more expensive than a flawed one. But remember that even a flawed diamond can be beautiful. Some flaws are so miniscule, and are only visible under a microscope. A somewhat flawed diamond can mean hundreds of dollars saved off the engagement ring cost. Cut – the cut also affects the engagement ring cost. A cut with a high level of complexity will cost more than a simple cut. Having a diamond shaped into a pear or heart will cost more than a simple princess or emerald cut. That’s because it takes more time and skill to cut more complex shapes. This can add a considerable amount to the final engagement ring cost. Setting – last on the list is the setting. The type of setting you choose also determines the final engagement ring cost. For example, a platinum ring will cost considerably more than a ring made of gold. Adding additional stones will also increase the final engagement ring cost. A solitaire is relatively inexpensive, but elaborate styles add to the engagement ring cost. You can keep your engagement ring cost low by opting for lower quality diamonds, simple settings, or choosing a stone other than a diamond. However, we have a large selection of diamonds that vary in price. Check out our selection to see what fits within your budget requirements. You can contact us to allow us to assist you in choosing the right diamond for you. We would be glad to help you.